I did this walk on 3rd July 2011 with Val and Chris. We had originally intended to walk this stage as a group back in May but that walk was cancelled as people were not available and then there had been difficulty finding another convenient date. Chris and Sara had actually walked this stage the week before the May date as they knew they could not make the planned date so this was the second time Chris was doing the walk in a couple on months. 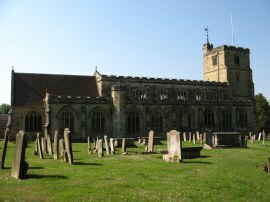 I had originally planned to drive to Tenterden and take the bus to Cranbrook however Chris kindly offering to walk the stage again made the transfers far simpler and quicker and along with Val provided pleasant company. We parked on the A229 Angley Road in Cranbrook, close to the point where the High Weald Landscape Trail crosses the road and the headed off down New Road to Cranbrook High Street where we headed to the right. The day had started lovely and bright and there was not a cloud in the sky as we made our way along the High Street, photo 1. Where the road bends sharply to the right we joined a footpath on the left that headed up through the churchyard of St Dunstan’s church, photo 2, and into a playing field. Here we went slightly off course, following a path that heads diagonally across the playing field instead of sticking to the correct route that runs down the right hand side. Back on course we crossed over the Waterloo Road and continued ahead along a field edge track before heading to the left across the middle of a field towards a small patch of woodland. Here the route heads briefly right before continuing through the trees, crossing over Cranebrook and then heading gently uphill to Golford Road. Here the route heads to the left along the road for a short distance before heading down a driveway on the left that runs past a house with a large flag pole in the garden. The path runs along the edge of an orchard before taking a stile on the right and running along the other side of the hedge. We missed this turning at first and continued round the edge of the orchard for a while before realising we were heading off course and retracing our steps back to the stile. For most of its length from Horsham the High Weald Landscape Trail has been meticulously way marked however there were a number of points on today's walk where signage was a bit lacking. The route then headed alongside, and across, a number of meadows planted with a tall grass, some of which had recently been mown, photo 3. 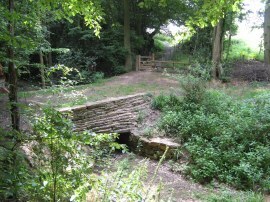 This stretch of path leads down to a narrow strip of woodland with another small stream running through it, photo 4, which is crossed by a wooden footbridge before the path headed on across a field that was planted with wheat. The path heads to the left round a barn at Little Coursehorne Farm before crossing a farm track and continuing ahead along field edge track. 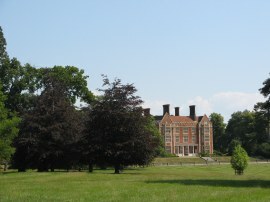 This is followed round past the buildings of Crabtree Farm before passing through another area of trees and across one more field to reach an area of parkland scattered with mature trees through which we were able to catch a brief glimpse of Benenden School, photo 5. The route then runs alongside some playing fields before turning to the right down the school driveway to briefly join the B2086 road. Here we headed to the right and then left along another footpath that heads between some houses and then runs along a field edge which is also marked on the map as following the course of a roman road. 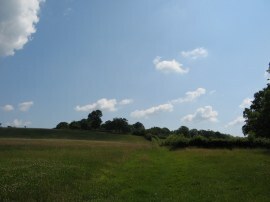 This path heads downhill to the entrance to Stream Farm before heading uphill to the left along a path that runs up to New Pond Road, photo 6. Reaching the top of the hill the route crosses the road and heads across a small paddock, close to a house, before heading alongside a field and across another small area of grass. This leads up to join a path that heads to St George's church in Benenden, photo 7, where we stopped for a short snack break. 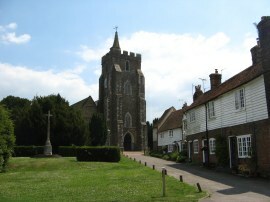 Continuing on the route of the High Weald Landscape Trail then heads alongside the edge of a large village green to reach the Street where the route heads to the right along the road for a short distance. 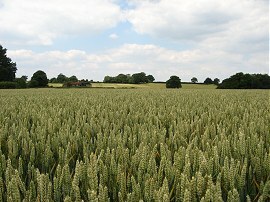 Passing a playing field the route then joins a footpath on the right which heads diagonally across the corners of three fields to join a farm track. Here we headed to the right for a few yards before continuing on along a footpath that heads over a field towards the trees of Strawberry Wood. 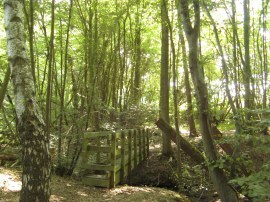 The route enters the trees and heads along a broad path which leads to a small culvert over a stream. Full details of when the culvert was built are not known although it is likely it was associated with the Wealden iron industry. The culvert has recently been restored and a board with a wind up handle which then plays recording about the site has been installed rather incongruously in the small patch of woodland. Leaving the culvert in Strawberry Wood the route heads along the edge of a field to reach Woodcock Road. Here we headed to the left before bearing right at the first road junction, photo 9, along a narrow lane typical of many that the route heads along. The route then runs past an interesting looking plant nursery before bearing to the left at the next road junction a short distance further on. This followed down to the buildings of Dingle Den Farm, and where the tarmac ends we joined a footpath on the left. This is followed towards the edge of Pookwell Woods where the path bears to the right to enter an area of orchards, photo 10. 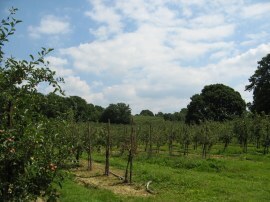 Once again we managed to go off course here, following the bottom of edge of the orchard around to Sandhurst Lane. The correct route, although we did not see any sign posts in indicating this when we entered the orchard, heads sharp left on entering the first orchard and then follows the top edge of the orchards, reaching the road a few hundred yards to the north of where we did. As we left the orchard over a handy gate we met a man in the road who said he was used to people going off course and that people all carried maps but didn't know how to use them! In our case this wasn't quite accurate, we did have maps that we can read very well, and a GPS to get our exact position; we just weren't using them! 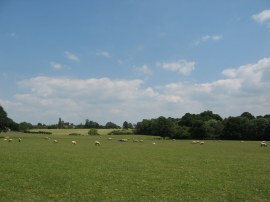 After heading up the road we rejoined the High Weald Landscape Trail as it headed over a large open grass covered field that was being grazed by sheep, photo 11. 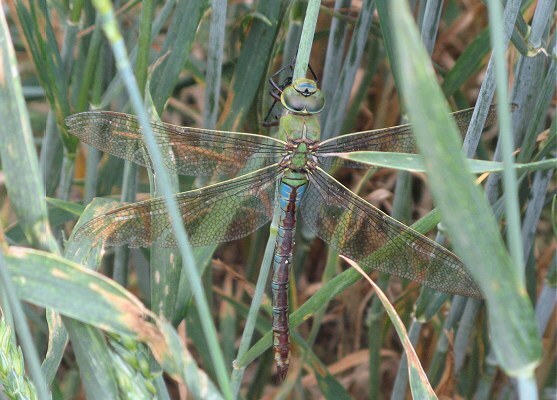 This led up to a small band of trees and then along the edge of another field as we made our way towards Rolvenden. 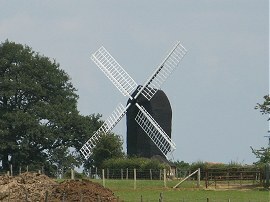 Away to the left we could see the windmill of Mill House on the horizon, photo 12. 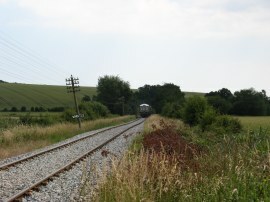 The path makes its way down to an enclosed track, before heading to right along a playing area and on up to the Hastings Road in Rolvenden. Here we continued ahead across the road into the grounds of Church of St Mary the Virgin, where we stopped for our lunch break. A woman there was preparing to serve cream teas later on in the afternoon and while we discussed our walk and our destination of Tenterden suggested it would be much quicker if we followed the road, not quite grasping the point of what we were doing! 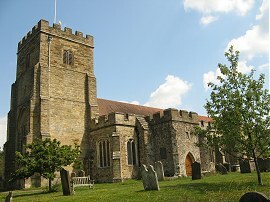 After our stop we followed the route through the churchyard to join a footpath running over fields. 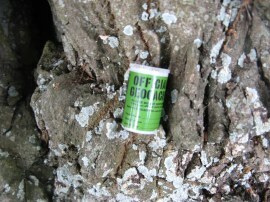 Close to the churchyard were some tall trees and in one of these we found a geocache hidden in the base, photo 14. One of our walking friends, Dave, is a very keen geocacher and now I often find myself having a quick check of likely sited when out walking. This section of path heads up to a small wooden area near Great Maytham Hall before turning to the right to run along a field edge path with a hedge on the left. 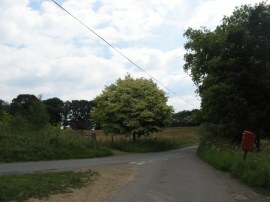 This leads up to the village of Rolvenden Layne where the High Weald Landscape Trail crosses over Maytham Road and continues ahead along Frensham Road. Reaching the end of this road the route then heads to the left down Mounts Lane for a short distance before joining a footpath on the right. 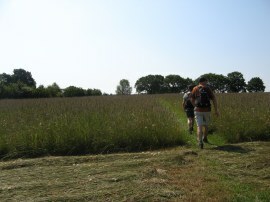 This path angled across one field before heading alongside the edge of another and through a small area of trees by a dried up watercourse before once again heading across two more fields, which were planted with wheat when we walked the route, photo 15, to join a farm track. From the farm track the route heads to the left across another small field of wheat towards some buildings marked as Lower Woolwich on the map. The paths through the fields in this area had been quite overgrown and I was glad I was not wearing shorts as we made our way through the greenery. 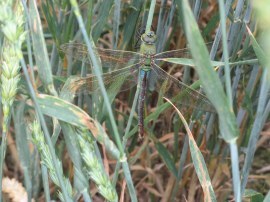 In this field I spotted a large Emperor dragonfly on one of the stems of wheat, photo 16, and leaving the field also spotted a slow worm disappearing off into the undergrowth. Turning to the right the route heads past a house before heading downhill along a field edge path. Here the correct route then heads to the left across the middle of a field however we missed the gap in the hedge and followed the field edge down to its end before turning left and following the bottom of the field round to rejoin the footpath. The path then heads alongside a couple of more fields before bearing to the left over a small section of field to reach the track of the Kent & East Sussex Light Railway. As we had been heading down to the rail lines we had spotted a steam engine go by and we had to wait to cross over the tracks as a small diesel train went by, photo 17. The path then heads by a small observatory, situated close to a sewage works, and uphill along the edge of a couple of fields before joining Plummers Lane. 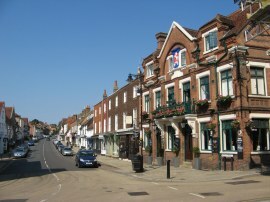 This heads by the buildings of the West View Hospital to reach the A28 on the outskirts of Tenterden. Here we headed to the right, continuing ahead along the High Street, photo 18, where we stopped for a quick drink in a cafe, close to where we had parked the cars in the morning. 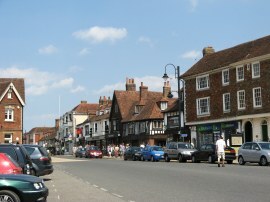 The weather had been quite good and was pleasantly warm by the time we reached Tenterden and we all ended up having a milkshake sitting in outside in the sunshine. Back at the cars we had walked 13.3 miles although I reckon only about 13 of these had been on the path itself due the number of slight detours we made during the walk! As mentioned earlier I was really grateful that Chris and Val did this stage with me as it did make the walk much easier to do. We now just have one stage left to the end of the trail in Rye. I have uploaded the route of the walk which can be accessed here: HWLT stage 6 Route.